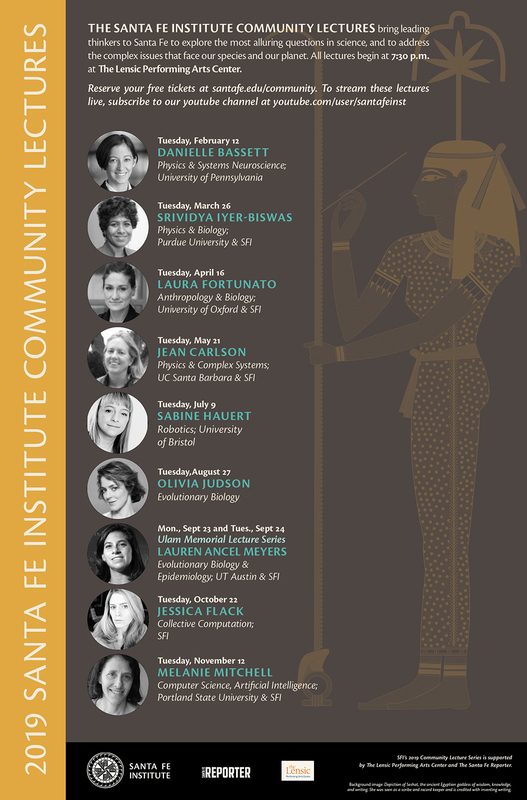 The Santa Fe Institute community lecture series has been running for more than 30 years. We bring the best minds to Santa Fe to discuss the most profound questions in 21st century science and society — always with a complexity angle! Rooted in Santa Fe, New Mexico and extending through our global network of researchers and scholars, the Santa Fe Institute brings leading thinkers to the local community through its signature Community Lecture series. For more than 30 years, this popular series has engaged the Santa Fe community with lively and diverse talks exploring a variety of topics, from cutting-edge research insights to the nature of human creativity. Lectures are free and open to the public. The Institute sometimes collaborates with other Santa Fe-based organizations in the arts, sciences, education, and government. Examples of past collaborations include a data visualization workshop at the Institute of American Indian Arts; a lecture series on the creative process in art and science with the Museum of Contemporary Native Arts; an afterschool STEM education program with the Santa Fe Public Schools; and meetings with City of Santa Fe officials to discuss urban planning and sustainability. All of our community lectures are held in Santa Fe's historic Lensic Performing Arts Center, who supports this series, along with additional support from the Santa Fe Reporter.